EF Commander is a powerful and multi-featured file manager witch a wide range of users, from beginners to professionals, will find easy to use. Here are some key features of EF Commander: Easy to use - The modern interface helps you to have full control over your files and folders. Tabbed interface - Define just the views you need in each pane for your folders and files. Full customized - colors, fonts, user defined columns, keyboard shortcuts, icons, etc. Thumbnails - Quickly and easily get an overview your photos or other image collections. Parallel file operations - Any number of operations at the same time. Direct link to PDAs with Windows CE. EF Commander Free is a multi-featured, complex, yet easy-to-use file manager aimed at all user categories in the audience. Even though this is the basic version of the EF Commander, it still manages to meet the most common requirements in the file management category. 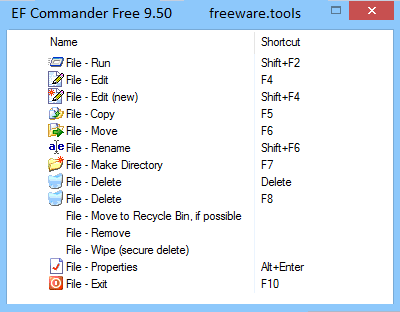 If you’re familiar with Total Commander or similar products, EF Commander Free is no challenge for you. It maintains the layout of the popular file manager – a two-sided interface, a toolbar of shortcuts and a few menus that concentrate the essence of the program. The two panels that divide the main window accommodate folder structures and allow you to perform operations such as copy / move files or folders faster. The two panels can be swapped, or given the same attributes by a simple click of a button. Other basic file management operations include delete, rename, make directory, search, compare directories, go to, to name the most common ones. In addition, you can manage network connections, disconnect network drives or shutdown the computer. The configuration section of the program allows you to enable functions such as animate hot links, show old toolbar symbols, look for a particular file by using Windows' search function, and keyboard combinations. What’s striking about this product is that during development, none of the existing features were cut off; bugs were fixed along the way, but the developer never removed or replaced any of the program’s abilities. To sum up, EF Commander Free allows for common file operations and simplifies your work. More advanced features, such as FTP management, disk formatting, CD / DVD burning, compression / decompression and others are available in the more advanced edition.